Stress is inevitable. It may seem that there’s nothing you can do about it. 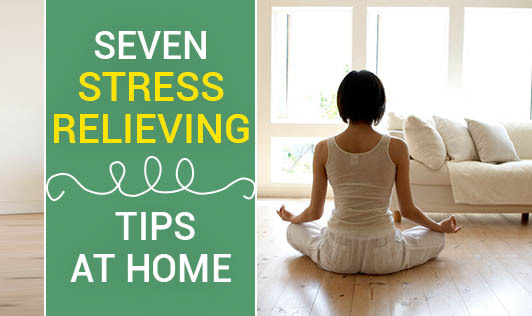 But including some daily chores in your home routine itself can help to minimize and cope with stress. Here are some relieving tips that can be practiced at home. Soaking in a tub full of warm water can work wonders when you're feeling stressed. The warm water relaxes you physically, loosening tight, stiff muscles. And, as a result, you relax mentally as well. One of the best ways to deal with a stressful situation, especially if the stress is caused by something you have no control over, is to not think about it. And one of the easiest ways to get your mind off things that are bothering you is to read a good book. You can read the latest best seller that you've been looking forward to. Or, if you don't think you will be able to concentrate on anything new, choose an old favorite. It's a proven fact that soothing music can be relaxing. The type of music you choose is entirely up to you. Buy a CD or cassette featuring soft, modern ballads, gentle classics, smooth jazz, or New Age music. When you feel stressed, pop the music into the player and let the music carry you away. Something as simple as taking a couple of deep breaths can work wonders. So, the next time you feel stressed; take a few slow, deep breaths. And, if you can, add a full body stretch. Stretching and yawning are also relaxing. Certain scents have been found to have a calming, relaxing effect on the human body. One of those scents is lavender. You can buy lavender candles at a health food store or online, and place them around your home or office. Whenever you're feeling stressed, burning a lavender candle can help you relax. Sunlight and fresh air have remarkable abilities to heal our spirit. Often something just as simple as taking a short walk around the block can help reset our priorities. Even yard work can be relaxing if approached from the right frame of mind. This is how you can keep yourself stress free for most of the day.